Much of what I've been working on in the studio over the last week has been boring -- to do and to show. Yesterday I made great progress and actually sewed something that can be shown. Not terribly exciting but at least something! I did mention it wouldn't be all that exciting. This is the center background of the wall hanging I hopefully will work on at retreat next week. Hum ... I may make a little change or two. I don't particularly like the brighter square in the center and the two darker squares on the diagonal in the bottom right. I'll check to see if the flowers might go over that bright square before moving it. I've also gotten all the squares done for the stars quilt which is my major project during retreat. 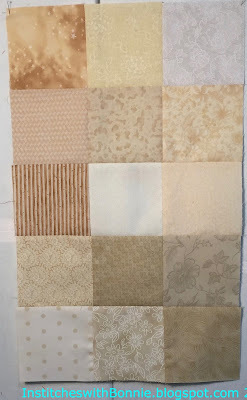 Using my Accuquilt Go (with only one 4.5" square die) I was finally able to get over 425 squares cut. 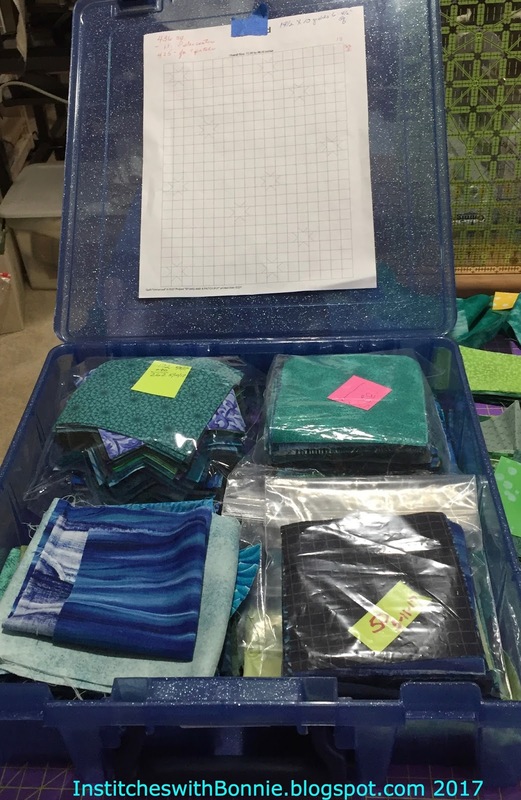 All the squares (with extras), the star points, extra fabrics and the layout plan are all tucked away in a project box ready to be loaded into my car. Yea! Now to get all the wallhanging pieces organized too. My, doesn't that look so nicely organized? Believe me, the minute I start working on it next weekend it will become a total mess. The next picture up is Fred with Ethel and another female friend visiting our bird feeder. The ducks have become constant visitors around our back yard. They check the ground around the feeder regularly. I recently refilled the feeder and knocked out some crunchy bits that were clogging the feeder. They should have been finding lots of goodies. Fred actually was down the stairs that lead to the basement and my studio. So I can look up from sewing and see what's happening. 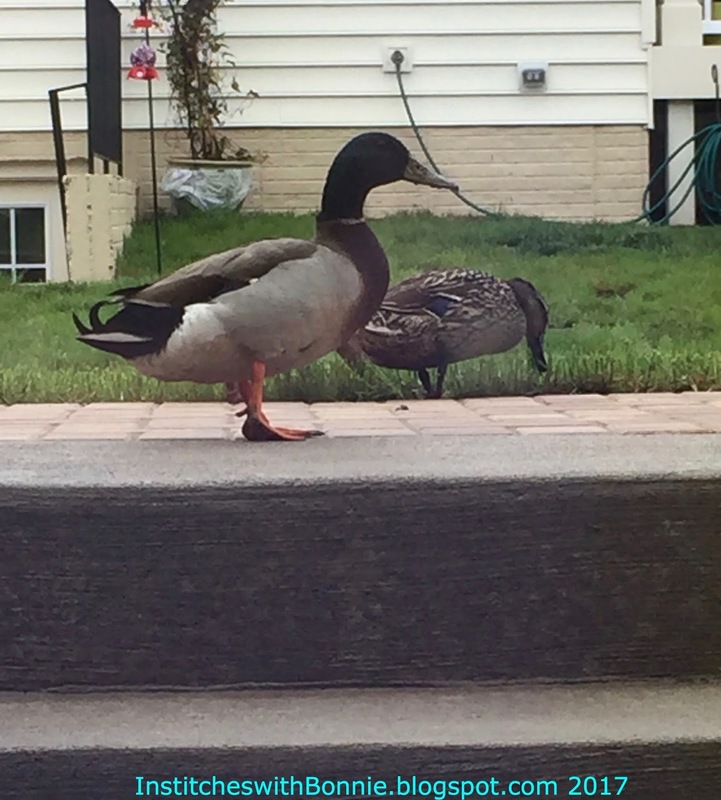 When I got up to take pictures he waddled back up the stairs. You can't see the 3rd duck behind Fred. It's been fun to watch their antics. Hopefully we will only have a few ducks visit because having lots of ducks would not be pleasant. That's it for me today. I'm linking up with Needle and Thread Thursday and Can I Get a Whoop Whoop? Take some time to visit some of the blogs to see what is going on with quilters around the world. You are totally organized and ready for your retreat. I am curious what you are going to end up with using those neutral squares. I like a pieced background with applique. 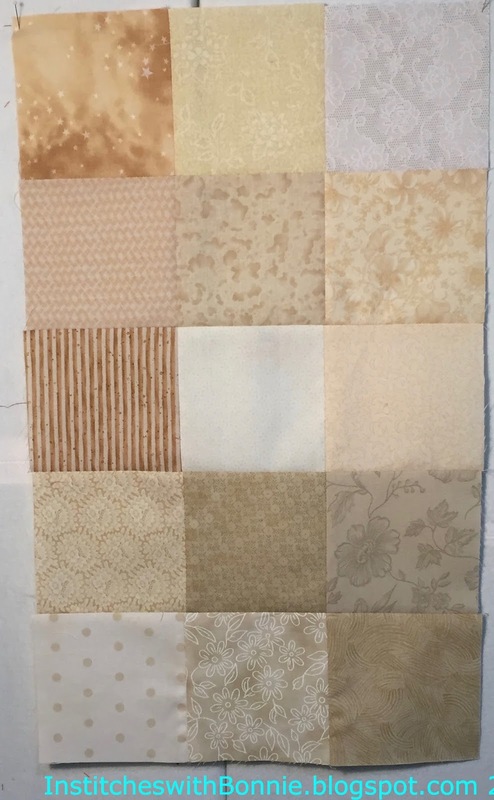 I once did a half-size blooming 9-patch in yellows as a background for a vase of flowers. I really need to get that one sandwiched and quilted. Preparation is time-consuming. You'll love having everything organized when you're at the retreat. I like those neutral backgrounds together. You sound like me -- sewing pieces together and then deciding to change it. I do that too often. You have a lot prepped for your retreat. You should get lots and lots of stitching done.